This is considered a seriously major landmark over at Etsy, and I am blown away by it. Etsy counts sales in an interesting way. Etsy does a lot of things in an interesting way. And yes, the word interesting is a bit loaded in this context. If I list five skeins of yarn from one batch, and five different people each buy a skein of yarn, it counts as five sales. If one person comes along and scoops up the whole batch, it counts as one sale. The 25 sets of stitch markers that I listed as a custom order counts as one sale. So, 1000 sales is a whole lot more than 1000 items. Oh! And I must point you in the direction of DancingMooney at etsy. DancingMooney bought the item that bumped the counter over to 1000. She is a lovely and very friendly etsy seller. She makes sweet jewelry that is well made and affordable. Thanks, DM, you're a doll!! And thanks too to all of you out there in blogland and beyond, who have encouraged and supported me in all kinds of ways. Thanks to all my buyers! Thanks for blogging about my shop, or the yarn you bought, the socks you knit. Thanks for pointing me in the direction of great ideas (I still want to know who gave me the heads-up about including a different stitch marker in my sets). Thanks for referring me to good yarn sources. I keep telling people over at the etsy forums that knitters are the best! 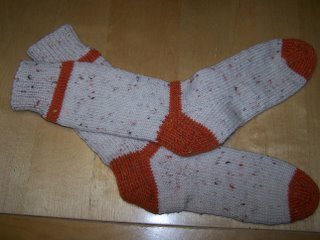 I'm pretty tired now, but I want to show you what I knitted with that fun orange yarn I blogged about a few days ago. The skein called October was enough to knit two pairs of these funky cozy fingerless mitts. I listed one pair in my shop, but it sold already. I'm thinking of keeping the second pair, but we'll see. And as a side note, Daisy wants it known for the record that she isn't actually that fat. She just looks that way when her cheek pouches are stuffed full of seeds. Hmph. 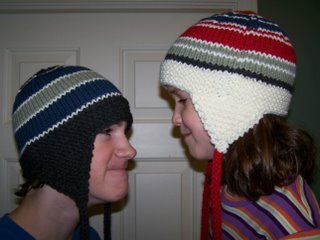 My friend Kirsten is the creative genius behind Yummy Yarn on etsy. The pink socks I blogged about yesterday were knitted with yarn she spun. She dyes, spins, and knits beautifully. She also designed that Full of Holes Triangular Scarf that many of you admired and then promptly went out and purchased the pattern. Now, how would you like to take a knitting class with a knitter like that???? She just emailed me to ask for my help. She is scheduled to teach a knitting class at our local arts centre in Port Moody. The class is on how to knit sweaters without a pattern, and it will be on Wednesday evenings, starting (I think) this Wednesday. The problem is that she is short one or two people to make the class full enough for her to teach. If she doesn`t get the extra bodies, they will cancel the class. If this appeals to you, you will need to contact the arts centre by Tuesday to register. The centre is a fun, relaxed venue for classes. And Kirsten is really nice, I promise. decrease, cast on, cast off. So, if this sounds like fun for you or a friend, or you and a friend, or your mother-in-law, or that neighbour down the street who keeps talking about knitting a sweater, then this is a great opportunity to Knit On! Here is a link to the Port Moody Arts Centre, which will give you all the contact information you need to register. Yes! Knitting has been happening around here lately. I finished my socks done in handspun sock yarn that I bought from Yummy Yarn at etsy. I love her handspun and have bought several skeins from her. This skein was called Rosie Toesies. The dark bits you see on one sock's leg and the other's toe came from a second skein of YY that happened to match. My work requires me to spend a lot of time on the computer, so I have been happy to grab any time away to knit. It is a treat to work with DRY yarn for a change, and I enjoy the simplicity of working on basic socks. Plus I love to wear them when they are finished. This is my latest pair in progress. I bought this handspun from Knittin Pretty at etsy. The shop is new, and she hasn't posted many yarns, but they are already popular. I bought this blue superwash merino called Lapis and another skein pictured below. I knit Rosie-Toesies on 4.0mm for the cuffs and 3.75mm for the rest. The Lapis yarn is a bit finer, so I'm knitting them on 3.25mm. I have to admit that I really like slightly heavier sock yarns. I took my Lapis sock and sock in progress over to a friend's house on Thursday. She is a new knitter, but when she tried on the sock, she was hooked on the desire to knit her own socks. My other yarn from Knittin Pretty is called Wild Thing, and I absolutely LOVE it. My favorite colours. The put up is a whopping 608 yards, which is a really good deal for the price I paid. Keeping in mind that handspun is pricey, of course. Here is another little goodie that I picked up from etsy. A sock knitting bag that I bought from Stuck in Illinois. 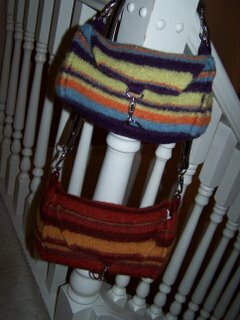 This woman makes lovely little sock knitting bags in all kinds of fun fabrics, and she sells them for only $10.00. And that includes shipping! I bought this Coffee Cups bag first, and it is really well made. Fully lined, light, and just the right size for a sock project. I take it everywhere. It sits on the floor or beside me and holds my ball of yarn while I knit. I liked it so much that I've ordered a second one. It is in the mail, but you can see it HERE. I think this is my favorite skein of yarn ever. Ever. I bought it from an etsy shop in the UK. I love the name of this shop: Shunklies. She called this skein Walk in the Woods, and it is so soft and squishy and beautifully spun. It has all my favorite yarny colours and in some lovely combinations. The yarn is on the chunky side, and it is a huge skein (200g/220yds). I'm thinking scarf knit on big needles. I can hardly keep my hands off it and can't wait to knit it, but I also can't really bear the thought of rolling it into a ball. I'm already wearing the pink socks again. They went back on my feet as soon as I finished photographing them. Now I think I want to go and roll around in yarny goodness. Ever notice that I measure my "tomorrows" in weeks or months? Seems that way at least. Okay, I promised some action on my sockapalooza bonanza-of-goodies, and here it is! My sock-pal lives in Anchorage Alaska, and she is wonderfully generous, as I have found other Alaskans to be. You can find her at her blog Knitting Escape, and hey! Look at that. 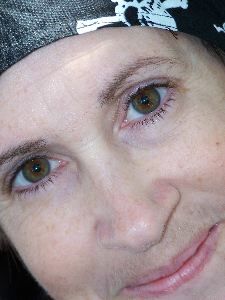 Not only does she blog about as often as I do, but her last entry was about MY socks. You can find all the lovely details there. Aren't they beauties?? My package arrived and I couldn't believe it. Lacy patterned socks just for me. I only ever knit plain stockinette socks, so my feet were feeling pretty special in their new socks. I had to sit and reflect for a moment that someone I've never met knit me such a lovely pair of socks. The socks came gift wrapped, and they were not alone. They came with a bunch of Alaskan goodies, including chocolates (notice they are absent from the photos, wonder why? ), and yarny gifties. Thanks, Barbara! You're a peach!!! Today, my kids went back to school. Technically, yesterday was the first day of school, but since they only went for an hour to satisfy some attendance-taking requirement, I call that the bait-and-switch back to school day. Today was the day that they left the house, caught buses and remained gone until about 4:00. THAT is my definition of the first day of school. I love my kids, but summer is long, and they get bored. Today I walked around the house in my underwear. Okay, I didn't do that, but I could have if had wanted to. I was supposed to post all the lovely things that my sockapalooza4 pal sent me, but I lost my good photography light, so it will have to happen tomorrow. I'll leave a sticky note on my laptop to remind me. I will also post progress on my second pink sock, which I'm hoping to finish tonight. I noticed that a lot of you were interested in the handspun sock yarn. I find that you have to haunt the place (etsy) a bit to nab the really good stuff. Since I'm such a nice person, I will tell you how to haunt some of the best places. Way #1: Go to Etsy Front Page; click on buy; categories: There are two categories for finding great yarn in the order that it gets listed. Those categories are KNITTING and SUPPLIES/handmade. I scan these listings regularly since those are the categories in which I list my items too. Way#2: Go to Etsy Front Page; click on buy, and use the search bar. Plug in handspun yarn, and it will show you all the listings from most recent back. Way#3: Go to my Etsy shop; scroll down, while scanning the right hand sidebar. You will come to a box with my Fishy Wishy avatar, under which will say profile and then favorites. If you click on my favorites (items/sellers), you can see a lot of the yarn shops that I like to say nice things about on my blog. I check those stores fairly regularly for new listings. If you have your own Etsy account, you can "heart" or favorite shops and items that you like and build up your own library of shops to stalk. Since this has been a very wordy post with no eye-candy, I will leave you with some eye candy from my own shop. All day I've been reminding myself to blog because it is my BLOGIVERSARY today!!! Yes, one year ago today I started blogging. Imagine that. I had to get my entry in before the date changed so that it would count. Well it is 9:45pm around here, so I say that counts. Over at Etsy, everything runs on NY time, so people are up very late while it is still pretty early for me. I have knitty stuff to show off too. This IS a day. Doug posing in his new socks: He says his feet are very happy. I knit the first one back in March with (yes) some of my very first hand-dyed yarn. Then the remaining yarn sat around with the orphan sock until about a week ago when I got going on the second one. Doug and I were watching a movie last night, and when he got up to get a snack, I snuck the socks onto his chair. He was so thrilled, he put them on right away and had a big smile on his face for the rest of the movie. Alas, I did not manage to get a photo of the finished Butterscoth socks for my sock pal. I did get them into the mail though, along with more sock yarn for her to enjoy and some fun stitch markers. And wait'll you see what I got from MY sock pal. Show and tell on that tomorrow. And yes, there will be a tomorrow. Yup! Another finished pair of socks. I finished these up at camp with the handspun sock yarn I bought from rmddesigns at etsy. I have another skein from her and a third on the way. We'll get to some show and tell on that eventually. 1. Handspun sock yarn is usually a wee bit heavier in gauge so socks fly along. 2. Handspun sock yarn is ridiculously expensive so you buy one of those instead of eight of something else and thus stash stays small and you use up your yarn purchases faster. 3. Handspun sock yarn has this funky colour changing thing going on so you can knit the plainest of socks without ever getting bored, cuz that yarn is always so durn interesting. 4. Every single stitch done with handspun sock yarn is a joy. 5. Um...I like handspun sock yarn. I mean, that is just one hunka hunka burning bliss. I can't wait to knit socks with that yarn. I bought it from a shop called Bizyhands at etsy (natch). And one of my favorite hand spinners at etsy is YummyYarn. I've blogged about her before -- she's the one who designed the Full Of Holes Scarf. This is my current sock on the go (one done, one at the cuff stage): 100% BFL Sock Yarn, handspun of course. So that's me, and a bit of what I've been up to knit-wise. I haven't been blogging 'cuz I hate summer and go into survival mode, which basically means ignoring a lot of things until the kids go back to school.